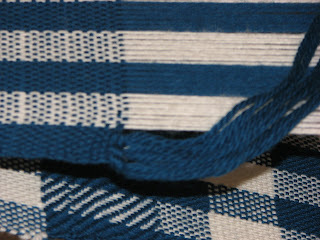 So, I repeated the four weaves (plain, basket, rib and twill) with two colors. 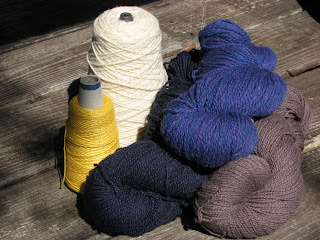 I thought I was adding grey to the black & white mix, but the yarn is really more of a taupe color. 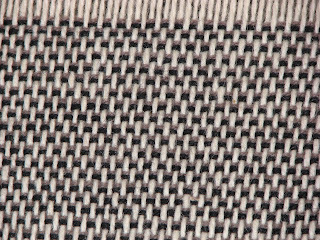 Here is the two color plain weave - black & grey weft, white warp. 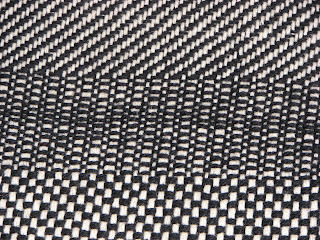 I like it better than the plain weave in just black and white. 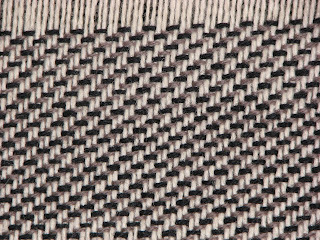 Finally, a two color twill - black & grey weft, white warp. 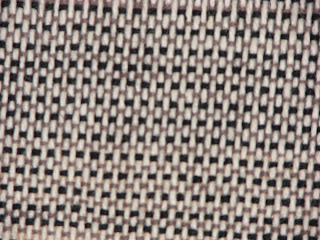 The pictures in the book didn't excite me, the assignment didn't call to me, and I didn't like the look of the plain weave. 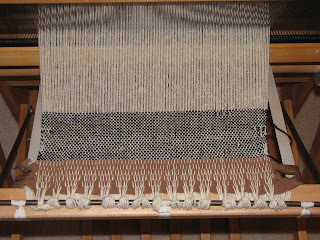 Next up, I'm supposed to repeat this with two colors in the weft. Then, finally, I repeat the whole sequence a couple more times, with a tighter sett and then a looser sett. I'm curious to see the impact of changing the sett. 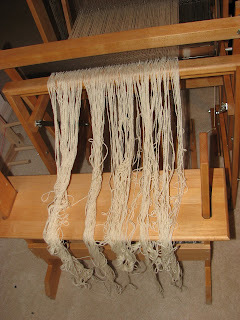 Sadly, not much progress to report on the weaving front. I did start my sampler and noticed almost immediately that wider is a bit more difficult – I have already made many more mistakes than I did on either of the two narrow pieces that I’ve done previously (as is painfully obvious in this photo). 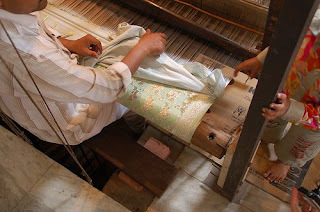 I have also discovered something that is apparently as true for me with weaving as it is with sewing – I'm less motivated when I do not find my materials aesthetically pleasing. I am just not loving this black and white yarn combination, and I think that is contributing to my lack of progress. But I am going to try to remember this and make an effort to select colors and textures that I find attractive whenever possible in the future. I have had a couple of happy mail days since my last post. 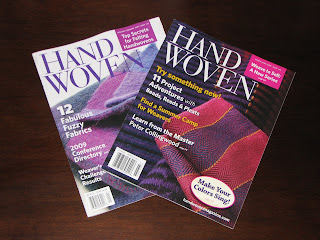 My subscription to Hand Woven started up and I got 2 issues within the space of about a week! Please remind me to never again show my first sampler to anyone! 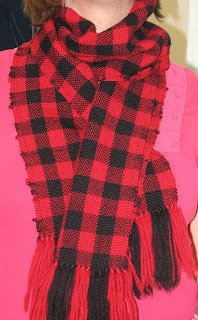 I showed it to David, and he thought I was offering him a scarf - next thing you know, I felt obligated to make one for him. I ordered some nicer yarn for her - part wool and part silk - I hope it feels softer than the pure wool I've used so far. It sure was more expensive! While I'm waiting for it to arrive, I warped my loom to do the next exercise in the Chandler book - one practicing plain, rib and basket weave, and experimenting with changing the sett. 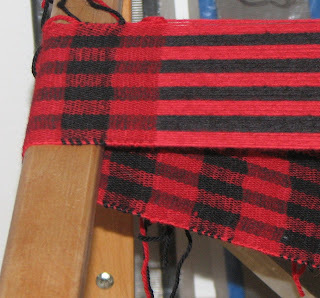 The exercises have me practicing a plain weave, rib weave, basket weave and twill while changing sett, in a plaid, and using yarns of different weights and textures. I'll also be trying a log-cabin pattern. That looks really cool in the pictures! 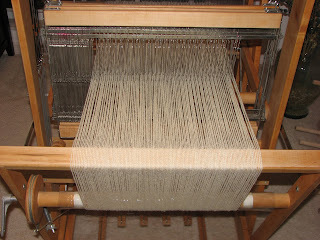 I'll try to get the loom warped for the first exercise in the evenings after work this week. I'd love to be ready to go next weekend! What are you working on this week? Well, people in central Florida have me to thank for the end of the "cold" spell and the return of our typically temperate February weather. It went amazingly quickly. I purchased the yarn last Saturday and finished weaving after work on Monday. 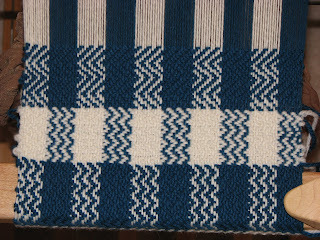 As advertised, the wool was very forgiving with my far-from-perfect tension and settled itself into nice parallel stripes after being washed. 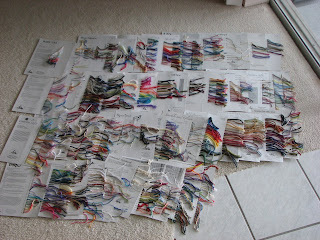 I was worried about the weft tails from each color change. I tied overhand knots, but many of them came out - in the washing machine... So, I used my sewing machine to stitch along each long edge. And I took that opportunity to put in my label. If so, the results are in: less than one week. But, wait, I have a rationalization. Oops, I mean, an excuse. Er, rather, a good reason. You see, I decided to order the yarn for the next set of exercises via the internet. And it will take about a week to arrive in the mail. So, what was I to do in the meantime? In any event, after many apologies all around, I promised to make him a scarf. 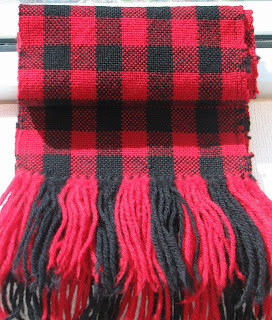 He rides a small, red motorscooter, so I decided to make him a red and black checked scarf out of the same wool I used for my sampler. It's not particularly soft, but hopefully it will be warm. One Sampler and Many Samples! 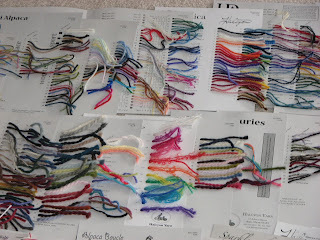 As for the "many samples" - I took Susan's advice and ordered a bunch of yarn samples. 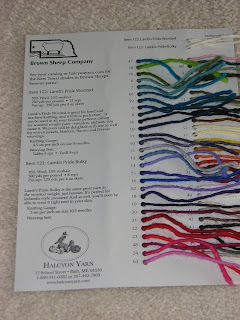 More specifically, I ordered Halycon's Yarn Store in a Box ($40 + shipping). Each card gives a lot of useful information, such as how to care for the yarn and the tabby and twill setts. Part of me wants to jump in and start on a "real" project. 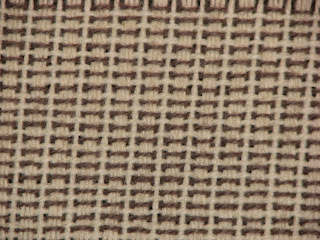 However, Chapter 6 of the Chandler book has 5 weaving homework assignments at the end, focusing on practicing plain-weave variations. Thank you so much to Lynette, Shannon, Jane, Sue, Cally and Amelia for offering up advice last week! I asked what people use as warp separators. 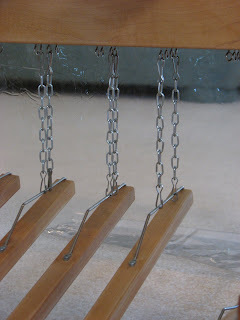 A couple of people use lease sticks - Jane made hers out of yard sticks, cut to the right length and sanded smooth. Finally, Lynette passed on a hint to periodically give the paper a good tug, to help tighten the warp, and Jane explained how she made her own raddle with some simple supplies from Home Depot. The Chandler book is great and I am really learning a lot! In many instances she presents several ways to do something and encourages the beginner to try them all. I appreciate this perspective and intend to do just that. 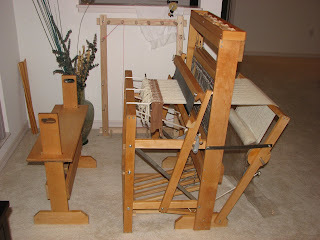 But still, I'm curious to hear from other weavers... For example, how do you warp your loom, from front-to-back or back-to-front? And why? Similarly, when do you beat your weft - before closing the shed, while it's closed, or after opening the new shed? And why? Were you taught these methods explicitly, or did you experiment with several different ways before settling on your current approach? I'd really be interested to hear your stories! Man, I have to say that the Chandler book is EXCELLENT! 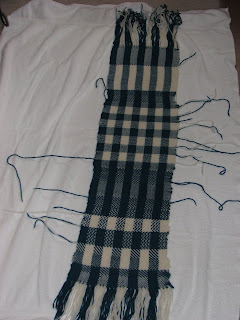 I tried some weaving before reading the relevant chapter, and experienced a few issues - such as the twill packing more tightly, having difficulty rolling the fabric forward, and getting little loops of yarn along the selvedges. Do you remember your first piece? What was it and how did it come out? Did you save it? I started my first blog (The Wedding Dress Saga) to chronicle my adventures sewing a wedding dress (my first) for a dear friend. 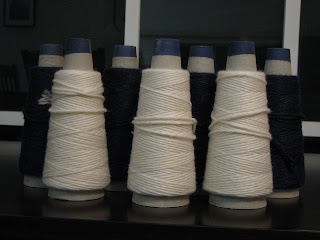 My second sewing blog (After the dress) chronicled the next 4 years of my sewing life. A new stage in life called for a new blog - welcome to: "In Over My Head"